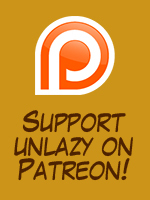 Unlazy started in 2006 after taking my Introduction to Comics class with Mr. Duncan. He showed us a bunch of minis he had collected and one of them stood out to me. Sadly I can’t remember the name of the mini since it was so long ago but the guy who made it started making a comic strip every day. As he continued making strips the story telling and style continued to improve. When he would get one thing down it seemed like he’d step it up a notch. I also read webcomics since I was in high school. So many of them started with poor story telling and not so great art. Yet as long as the creator/s kept working it kept improving. I wanted to keep improving and wanted to prevent myself from becoming lazy. A daily comic seemed possible. This really inspired me to start my own daily comic. So that is the birth of unlazy! Some days are easier than others. There I times I fall off the face of the planet. Still, when I’m back on my feet I end up turning back to unlazy. It is important to try your best and know yourself. Push the limit without breaking yourself. It might not make me millions of dollars or fame but that isn’t why I started this strip in the first place. It was to continually inspire myself to create something every day and hopefully inspire others to be unlazy as well. I just re-blogged The Sarah Goode comic strip you created. I gave you full credit and there is a link to your website/blog. Please come visit my blog and read the post I put your strip in.